Beat together 350g mashed potato, 80g plain flour, 1 egg yolk and 3 tbsp grated onion. Season, then roll out on a floured surface to 1.5cm thick and cut into rounds with a 6–8cm cutter. Heat some vegetable oil over a medium high heat and fry the potato cakes until golden, 4–5 minutes per side. Mix some chopped chives into sour cream. 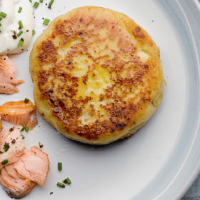 Serve the potato cakes with hot smoked salmon and a dollop of chive cream.